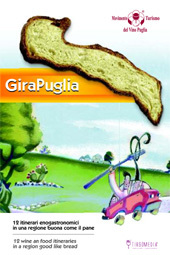 Girapuglia's recipe for success comes from Puglia's tradition and is based on simplicity and on the combination of good quality raw materials: the beauty of the land, the farming culture, good accommodation, wine and food tasting events, a culture of hospitality, ancient traditions, a history stretching back thousands of years, and endless aromas and tastes.The results are these lovely itineraries which allow you to discover Puglia's great food and wine heritage, and to explore a territory which transforms its excellence into a tourist destination. In this land of extraordinary natural beauty, the delicate nuances of wild orchids favor the development of new loves, while the magical oranges, blessed by Valentine's Day, have the power to seal them. The gastronomy of this land is a flavor kaleidoscope, the result of the mountains presence, forests and fertile plains, populated by ears and vineyards: on the table stand asparagus and wild vegetables, ham fine crafts, historical Doc and many types of fresh pasta. The greatest writers-travelers have celebrated several times the exciting dawns on the Adriatic Sea, in the majestic castles and watch the maritime ports activity. Wild vegetables and dry stone walls accompany the traveler along the ancient streets of transhumance, which remains abundant evidence in this area with a strong agricultural tradition. The fragrance of the Altamura bread, only DOP bakery in Europe, was known by Roman who already appreciated also delicious Cardoncello mushroom, for the aphrodisiac properties.